Selling for $985 0 0 Like this product? With dual purpose Typing Covers1 that let you work the way you want, Surface Pro 2 is the ultimate business tool. The Surface Pro Pen (included) lets you write, mark up presentations, and e-sign documents. Featuring 128 GB of internal storage capacity, the Microsoft Surface Pro is a thick and compact tablet computer that works with the Pro 8 operating system. This Wi-Fi tablet has a 10.6-inch touchscreen and comes with a solid black frame. 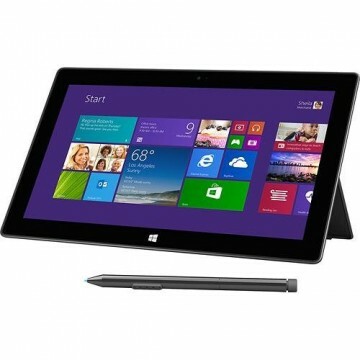 The frame on this Microsoft tablet is made of a magnesium casing for added durability in rough situations. In addition to the touchscreen, the Microsoft surface can also be hooked up to a keyboard for added typing convenience. Also featured on this Microsoft tablet is the exclusive ClearType HD viewing technology that has an aspect ratio of 16:9. A front- and rear-facing digital camera allows for quick photography as well as self-portraits, while a thick kickstand helps it stay upright at 22 degrees when in use. This Wi-Fi tablet also includes a slot for a microSD card, as well as a USB 2.0 port for added connectivity. The Microsoft Surface 8 Pro also has a screen intensity that can be adjusted. The weight of this Microsoft tablet is 1.5 lbs. Surface Pro 2 runs all your favorite Windows software, including the entire Microsoft Office Suite 1 apps. With a next-generation Intel® Core™ i5 processor designed for optimizing battery life, Surface Pro 2 provides incredibly fast performance while conserving energy, so you can do more on a single charge. ClearType technology and 1920 x 1080 resolution offers crisp visuals and easy navigation. Auto-adjusting screen intensity gives you the clearest picture possible, whether you're indoors or out. Surface Pro 2 has front- and rear-facing 720p cameras so you can take photos and have crystal-clear video chat. With Surface Pro 2, get 1 year unlimited free voice calling to landlines in over 60 countries, and free Skype Wi-Fi at over 2 million hotspots worldwide. You also get 200GB additional SkyDrive storage for 2 years. Get 1 year of unlimited free voice calling to landlines in over 60 countries. Calling excludes special, premium and nongeographic numbers. Free Wi-Fi at Skype hotspots worldwide with your purchase of Surface 2 or Surface Pro 2. - Dimensions: 10.81" x 6.81" x 0.53"